Mix together the flour, baking soda and salt; set aside. Beat the cold butter and shortening with an electric mixer until creamy. Add both sugars and continue beating for another two minutes. Beat in the vanilla. Scrape sides of bowl. Add egg and beat for about 30 seconds or until egg is incorporated. By hand, stir the flour mixture into the butter mixture—dough will be pretty thick. 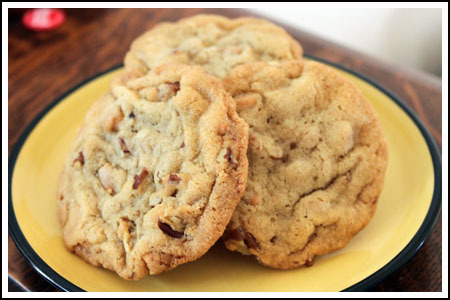 Mix in the butterscotch chips and pecans. Chill the batter for ½ hour or until ready to bake. Preheat oven to 350 degrees F. Line a couple of cookie sheets with parchment paper. Scoop dough by generously rounded tablespoons and shape into large balls. Space about 3 inches apart on the cookie sheets. Bake one sheet at a time for 12-15 minutes or until cookies are brown around the edges. They won’t be extremely brown when they come out of the oven, but if the edges are browned at all they’ve probably baked long enough. Mine took 15 minutes. Let cool on the cookie sheet for about 3 minutes, then transfer to wire racks to cool.